Today I get to be the dental patient. My lower teeth are a little bit crowded, and as we mature our teeth tend to shift forward, so my crowding wasn’t getting better; it was getting worse. You can see in the photo below, my lowers seem to be leaning to the left - Pinko Commie teeth! So I asked Dr. Urban to fix that for me. 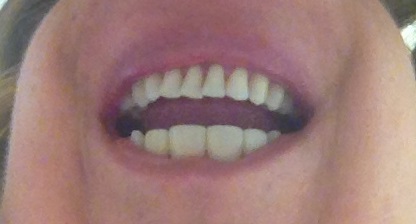 He got these nifty invisible braces for me, and I put the lower tray in this morning. You can see the actual tray to the left here. Dr. Urban did the old fashioned, metal braces for me back in the 1990’s. Boy did they hurt! But I had a much bigger issue then. However, even then my case was considered “minor orthodontics”. This issue is much easier and less painful to correct. Here you can see the tray in my mouth and how invisible the tray really is. I am already able to talk very well with it in place. So in a few months my lower teeth will be straight, and then Dr. Urban will put a permanent retainer behind my lower teeth (essentially he will bond a wire behind my lower front teeth to keep them in place). Flossing will be more of a challenge, but I will be happy to have my teeth really straight, and know that as I mature they won’t be shifting forward anymore.